Not all dogs in need of rescuing come to us in perfect health. Some are epileptic, some have chronic respiratory issues, some come to us with mangey skin, but one that stands out in recent memory had something I and most fellow rescuers haven’t seen up to that point: Aiva almost lost her tail. 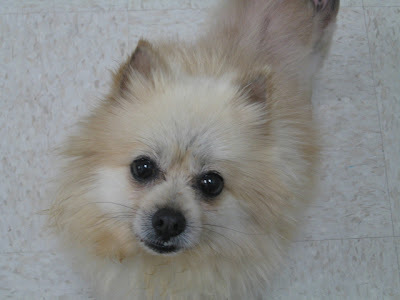 A faithful volunteer at a high kill shelter first noticed this cute taupe-colored Pomeranian at least 5 months before I first laid eyes on her. When she reached out to pet her, Aiva instantly transformed into a snapping and growling monster. Usually, such a dog would be put down almost immediately because of its aggressive tendencies, but Kay begged the shelter to release Aiva to her, and got her wish granted. Dogs typically go into a kind of adrenaline overdrive when at the shelter, but this girl’s behavior seemed particularly peculiar. Imagine everyone’s surprise when during her vet checkup a few days later it was discovered that underneath all that fur, her tail was almost severed off! No wonder she won’t let anybody touch her. Necrosis is akin to a flesh-eating bacteria, so getting rid of rapidly dying tissue like that something like is no small feat. How do you heal a wound that refuses to and gets bigger every day? 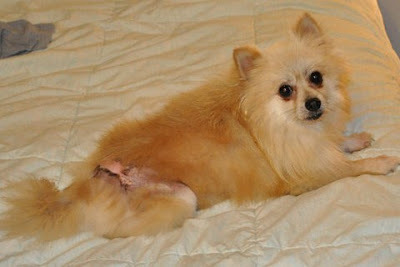 Vet told Kay, the volunteer in this story, that Aiva will lose her tail within a week. What happened next is a testament to Kay’s love and utmost dedication to Aiva and animals like her. She drove Aiva to Virginia Tech University’s famous Veterinary School, to receive another professional opinion. University took her on as a teaching case for their students. Imagine this little scared dog living in their medical teaching facility for over 5 months (!) to be subjected to almost daily skin grafts, massive concoctions of antibiotics mixed together with endless hugs and attention from the students. Most importantly, Kay won the fight: Aiva lived, tail and all. Aiva arrived at my house with a suitcase of drugs and a special instructional note from Kay. You would think after being dotted on for months, Aiva would relish being with people, but that wasn’t the case. While okay with dogs, she was still so anxious around people. Plus, after being confined to small spaces to speed recovery, crossing my living room floor from one end to the other was like crossing the chasm. I feared she would simply freeze with fear at the Adoption Fair, but then came Trish and Sharon. Having raised two gorgeous white American Eskimo dogs, Snowball and Lilly, for the past 17 years, they just lost Snowball to old age and were hoping to find a worthy companion for Lilly. 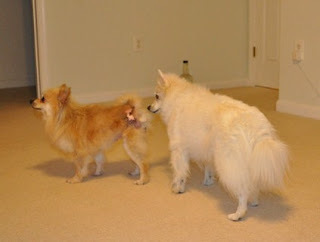 Imagine their surprise when they met my little American Eskimo look-alike called Aiva. I swear that dog’s paws never touched the ground once in the two hours these ladies spent at the Adoption Fair. She was hugged, kissed, carried, petted and babied the entire time! Anyone who ever skinned a knee knows how long it takes to get that injury to heal. Staying out of the sun, eating vitamins and befriending the highest SPF number sunblock cream are just the beginning. Months of efforts to avoid getting a nasty scar. Aiva wasn’t that lucky. Thanks to faithful skin grafting at VA Tech, she did get her skin back, but that skin came with no built-in protections from the elements, especially the sun and infections. All of which means the danger of getting skin cancer is ever present too. 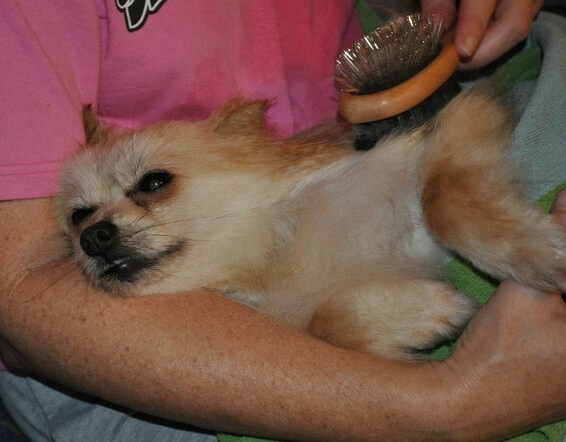 Where Aiva was lucky is in the fact that her new adopters were more than committed to follow her twice daily SPF 100 cream applications, plus an occasional aloe vera massage and a daily brushing routine process. 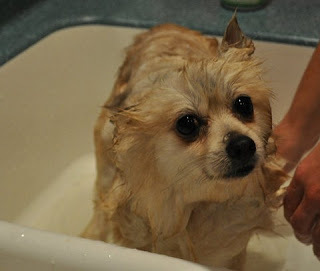 Lilly, their American Eskimo sweetheart also took it upon herself to look after the little (almost half her size) taupe Pomeranian to usher her into a new life, without catastrophic injuries and daily medical procedures. Just lots of love and warmth for a scared little dog that almost lost her tail to human cruelty and negligence.